1/2 Cent, Philadelphia, 1825 AD. (1858.1.1). Donated by ANS founding member Augustus B. Sage. The United States Department includes all coins issued in and for the British North American Plantations until 1783 and for the United States thereafter, including Alaska and Hawaii; Puerto Rican coins are included in the Latin American department, because the most important issues for Puerto Rico were struck before 1898. 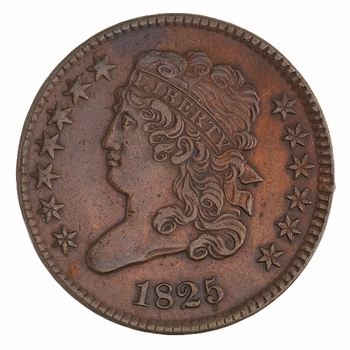 The United States cabinet began with the very first coin donated to the ANS, a half cent of 1825, (ANS1858.1.1), a piece donated by Augustus B. Sage. The cabinet grew dramatically in the first years of the twentieth century, when John Sanford Saltus donated his collection of US coins. Among these were 124 large cents, comprising all major varieties then catalogued, including the strawberry leaf, of which only four are known. Another major donation came as the result of the 'museum cartel.' J. P. Morgan, George F. Kunz, and Archer M. Huntington were all museum benefactors, but they did not want museums to compete with each other for objects. The American Museum of Natural History at first collected coins as an extension to its collection of gems. As the head of Tiffany & Co., George F. Kunz had prime access to gem sources -- he was the discoverer of the mineral 'kunzite' -- but was also a major benefactor of the American Numismatic Society. In return for Kunz's support of the American Museum of Natural History's gem collection, the AMNH collection of coins passed to the American Numismatic Society. This was an extensive collection of United States coins, focusing on proofs, from 1858 onward which had been assembled by the Philadelphia collector Robert C. H. Brock and bought en bloc by J. P. Morgan, donated to the American Museum of Natural History, and then transferred under the terms of the museum cartel to the American Numismatic Society. The middle years of the twentieth century saw the acquisition of important collections of pre-federal issues, partly because of the interest in these series shown by Sydney P. Noe. In 1931 the New Jersey Historical Society placed the collection of Connecticut coppers assembled by the late Frederick Canfield on loan at the ANS, subsequently donating this and other portions of the Canfield collection to the Society. In 1945 the Society bought Harry Prescott Clark Beach's collection of New Jersey coppers. William B. Osgood Field donated his fine collection of Massachusetts silver coins in 1946. Another major acquistion for the US cabinet also came in 1946, when the George H. Clapp collection of over 1500 large cents, donated under a 1937 deed of gift, was physically transferred to the Society. Another physical transfer at the same time, the collection of Houston engineer Arthur J. Fecht, did not become Society property until his sister, a trust beneficiary, died in 1980. The Fecht collection included many fine rarities, such as the first Paquet 1861-S double eagle to be photographed. The US cabinet has been enhanced by the donation of numerous outstanding rarities. Saltus donated the Confederate half dollar (one of four known) to the Society in 1918. Mr. and Mrs. R. Henry Norweb, senior, donated a Brasher doubloon. Eric P. Newman persuaded the Chase Manhattan Bank, N.A., to donate its 1804 dollar when the Chase Manhattan Money Museum was dissolved. The US cabinet has been the basis for many publications, such as David Bullowa's book on commemorative coins, Noe's die studies of Massachusetts silver, Eric Newman's study of the coinage of Virginia and the Good Samaritan shilling, the now fifteen published volumes of the proceedings of the Coinage of the Americas Conference, and the study of the money of the American colonies and confederation by Philip Mossman. Many of the pieces illustrated in Walter Breen's encyclopedia are from the collection of the American Numismatic Society; that was a culmination of nearly forty years of study of the collection by Breen, who began in the spring of 1950 when he studied the auction catalogues of the ANS library and the coins in the ANS cabinet as a short-term member of the staff. The total figure for the United States cabinet is approximately 32,000 pieces.